Along with the remarkable Umaid Bhawan in the capital of the Indian province of Rajasthan - Jodhpur, the greatness of Indian maharajas and rulers bequeathed to posterity and the Present, one of the most remarkable fortresses throughout India - Mehrangarh Fort. Mehrangarh Fort and Umaid Bhawan are encircled by the high hills, the city seemed to have guards who protect it. Today the Mehrangarh Fort is known best in that it houses the best and most interesting museum in the Indian countryside. Mehrangarh Fort dominates the urban area of its hill, which reaches a height of 125 meters. The construction of the structure of the impressive Mehrangarh Fort began in 1459, it was ordered by the founder of Jodhpur. Form the final of the impressive Mehrangarh is one of the most impressive palaces in India today. Walls outside of the fortress Mehrangarh reach 36 m height, and width is about 21 meters. Furthermore, to the large proportions, Mehrangarh is famous for exquisite wall decoration and large picturesque Palace spaces. Mehrangarh the fortified city grew up around the Mehrangarh Fort. It can be entered through one of his seven gates. The biggest of them is Jai Pol and the so-called Gate of Victory. Today, visitors who enter through this portal have the opportunity to see the shiny gold imprints of palms, 15 Mahara, as were called the wives of Indian rulers. In Indian culture ruler’s wives enjoy a special tribute, a tradition once required the wife of the deceased ruler to be burned alive alongside her husband. This tradition remains alive until the 19th century when it was banned by the British. 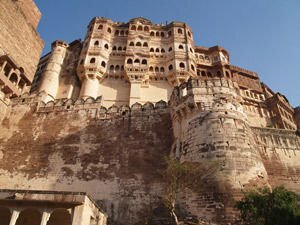 Broadly fortress Mehrangarh is divided into three separate divisions - devoted to foreign personnel served, there were kitchens and stables, in the middle zone you enter the Palace Complex and the third part was assigned to the female realm, in other words - the Harem. Harems of rulers numbered several hundred women. In the inner courtyards of the fortress, Mehrangarh connects those different parts of the Palace Complex, today visitors see beautiful and exquisite stone carvings. Here is the marble throne, which were carried all the coronations of Maharaja Jodhpur. Museum in the Mehrangarh Fort consists of various exhibits like weapons, costumes, paintings, and decorated in different styles rooms.